The credit card invoice is for any client or customer that is to be making a payment for a receivable via a credit or debit card issued by Visa, MasterCard, AMEX, or Discover. This may be for a one (1) time payment or to be set up on a recurring basis. The invoice is typically sent by the issuer with the recipient required to enter their sixteen (16) digit card number, security code, cardholder’s name, and billing address. The invoice is then sent back to the issuer and processed for payment. PayPal Invoice – Can be used to process a credit card through an individual or business PayPal account. Gain access to the Credit Card Invoice Adobe Template with either the button or the link labeled “Adobe PDF.” This file should be saved to your machine, so you may use it at your discretion. The Name of the Credit Card Company using this paperwork to inform a Client of money owed should be furnished to the area labeled. “Company Name” near the top left of this page. Once the Credit Card Company Name has been reported, solidify that it is the originator of this paperwork by producing its official Mailing Address. Begin entering this information with the “Name” line and continue to the “Zip Code.” Make sure to supply each component of the Mailing Address to the appropriately labeled line. It is also important that the Customer be able to reach the originator of this paperwork in an immediate manner. Typically, most Customers prefer either sending an E-mail or calling directly. Therefore, provide a well-maintained “E-Mail” address at the Credit Card Company along with its “Phone” Number. The Invoice Number assigned to this Credit Card Invoice in the Credit Card Company’s internal records should be placed on the “Invoice #” line. The Customer will need to be directly addressed in this document. Locate the “Bill To” heading in bold. The information here can be considered comparable to that presented for the Credit Card Company. Fill in the Customer’s Legal “Name,” “Street Address,” “City, State, Country,” and “Zip Code.” This address should be the same Address this Invoice is sent to unless otherwise indicated by the Credit Card Customer. The “Products” purchased by the Customer should be well-defined in the next section. Four columns (labeled with the information each requests) will allow you to report what Customer purchases the Credit Card Invoice concerns. The first two columns will deal specifically with what the Customer ordered. 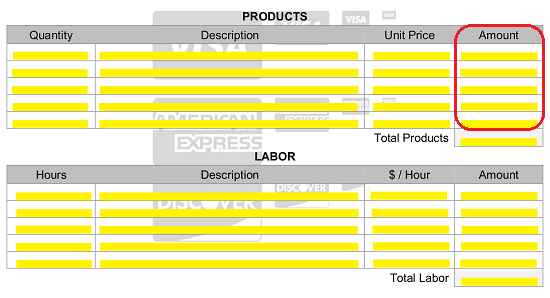 Fill in the “Quantity” and “Description” of each purchase this Invoice is reporting. The last field in the “Amount” column must be the cumulative total of the values entered above it. 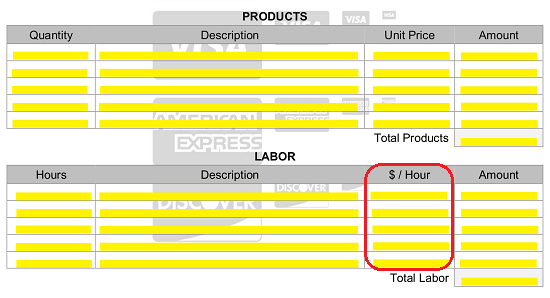 If the Credit Card Company is billing the Customer for “Labor,” then include information regarding the service or work provided by the Credit Card Company. First detail the number of hours and the work project the Customer is being billed for. The total number of “Hours” spent performing this work should be supplied to the first column and an adequate “Description” of the work done during that time should be furnished to the next column. The pay rate for the work done should be reported as a dollar amount per hour in the “$/Hour” column. 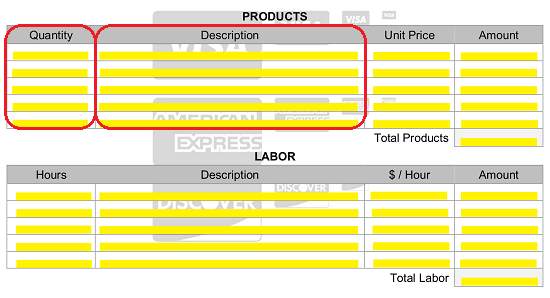 Finally, report the “Amount” of money the Customer must pay for each service provided in the last column. Total the figures you entered for each row and produce the sum to the “Total” box. The last table, composed of the “Subtotal,” “Sales Tax,” and “Total” boxes, will present the final figures for what the Customer must pay. Present the sum of “Total Products” and “Total Labor” in the “Subtotal” box. Report the “Sales Tax” the Customer must pay to the second box. The Credit Card this Invoice concerns should be well documented in this paperwork. Refer to the bottom left-hand corner of this page to complete this requirement. Several pieces of information under the heading “Credit Card Details” should be presented. This will consist of the “Cardholder’s Name,” “Credit Card Number,” Credit Card “Expiration Date,” Credit Card “Security Code,” and the “Billing Address” associated with the Credit Card being paid. 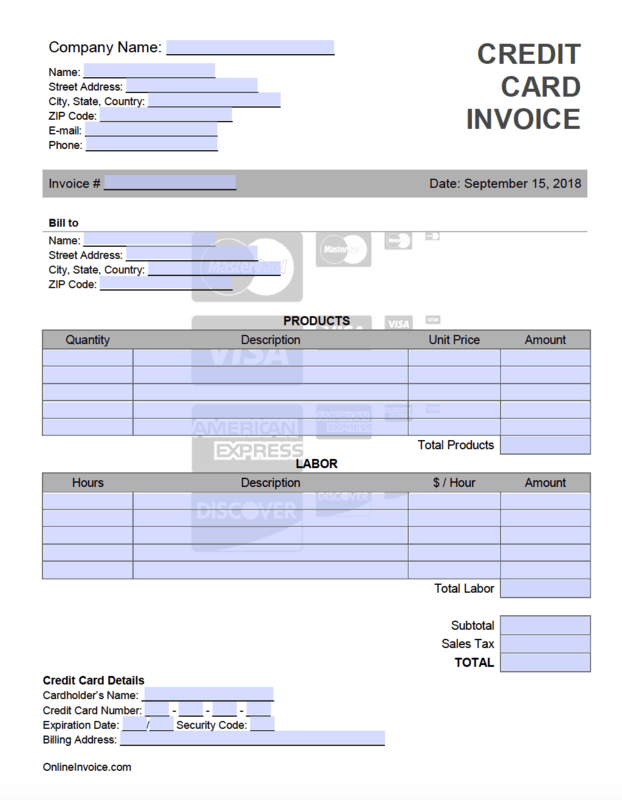 The Invoice Spreadsheet necessary to issue a Credit Card Invoice can be obtained directly from this page. Use either the button corresponding to the preview image or the link above. The first cells in column A should be provided with the Credit Card Company Logo (A1), the Credit Card Company Name (A2), and the Contact Name for the Credit Card Company (A3). The next cells in this column (A4 through A6) focus on the Credit Card Company’s Legal Address. Supply the components making up this Address as requested in each of these cells. The Credit Card Customer should be given a method to contact this Company at will. The last two cells of this area will request the “E-Mail” Address that should be used to contact the Credit Card Company as well as a well-maintained “Phone” Number. The Credit Card Company will need to inform its Customer of the Reference Information it uses for this paperwork. To this end, locate Cell F4 then, supply this document’s Invoice Number to it. The “Date” field to the right will display the current Calendar Date, however, if required you may change the contents of this cell (H4) at your discretion. Once you have defined this document’s reference number, you must solidify its recipient as the Customer or Client. We will turn our attention to column A and supply the Client’s Name and Address to the appropriately labeled cells. The next section will give the Credit Card Company with a method to report what it is charging the Customer for on this Invoice. The two areas here (“Products” and “Labor”) will each be organized as a table. 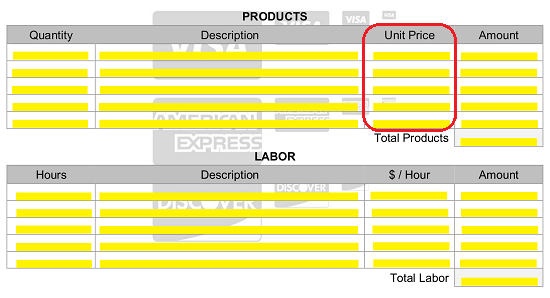 The “Description,” “Quantity,” and “Unit Price” related to the Credit Card Customer’s order should be input in column A, Column F, and Column G (respectively). This information will produce the total “Amount” (Column H) the Customer must pay for each of his or her orders. This column, in turn, will be summed in Cell H23 (labeled “Total Products). The area below, “Labor,” will enable you to provide report on the Credit Card Customer’s purchased services in a similar fashion. 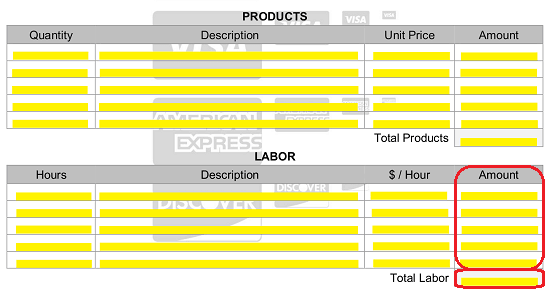 The “Description” (Column A), “Hours” (Column F), and “$/Hour” (Column G) requests details for each Service supplied to the Customer, the length of time required to perform said services, and the dollar amount per hour that must be paid for these services. Column H will automatically display the “Amount” owed for each Credit Card Service (by row) then total this amount in the cell H31 (“Total Labor”). The area below these two tables (in Column H) consists of three labeled Cells (“Subtotal,” “Sales Tax,” and “Total”), two of which will auto-populate with the appropriate sums. You must report the “Sales Tax” that accompanies this Invoice “Total” to Cell H34 to complete this section. 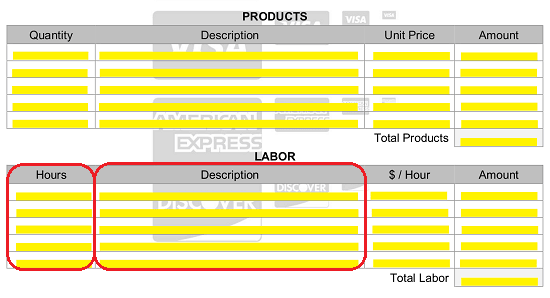 The last few cells in Column A (A32 through A36) under the heading “Credit Card Details” will require information defining the Credit Card this Invoice is focused on. Use these cells to record the “Cardholder’s Name” (A33), “Card Number” (A34), “Security Code” and “Expiration Date” (A35), and the Credit Card Customer’s “Billing Address” (A36). Make sure this information is entered accurately since this Invoice Number will attach the Charges above to the Credit Card presented here.